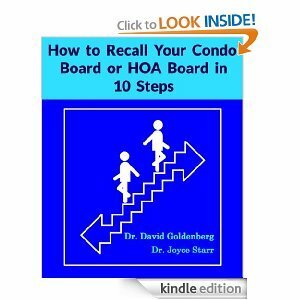 Authored by homeowners association expert Dr. David Goldenberg, this report leads you through the condo association and homeowners association (HOA) recall ordeal. Read this guide BEFORE launching a recall petition. Discover which tasks must be undertaken, in what order and precisely how to carry out your recall plan. One mistake could easily derail months of hard work. HOA board and condo board recalls require precision and persistence. Dr. Goldenberg is a leading economist and homeowners association expert. He’s the author of Creating, Modifying or Revoking Home Owner & Condo Association Documents: Protecting Your HOA or Con-Dough – offering a practical set of governing documents for deed restricted communities. How to Recall Your Condominium Association Board, Homeowners Association Board or Individual Board Members in 10 Basic Steps. What every condo owner & homeowner association member should understand about the recall process. Read this guide BEFORE launching a recall petition. Discover which tasks must be undertaken, in what order and precisely how to carry out your recall plan. One mistake could easily derail months of hard work. HOA board and condo board recalls require precision and persistence. A leading economist and homeowners association expert, Dr. David Goldenberg is the author of Creating, Modifying or Revoking Home Owner & Condo Association Documents: Protecting Your HOA or Con-Dough.– A consulting economist with decades of international experience, his books include The Art of War 3: The Canons of Commerce. Dr. Joyce Starr, a leading condo rights expert, has authored 17 books, including, Defend Your Condo & Homeowner Rights. She recently served as treasurer for her mid-sized condo complex, saving the Association over $70,000 through renegotiated contracts.